First, sugar water was prepared at the rate of 1 gallon of water to 18 cups of sugar. Next we readied the pollen patties from Global. 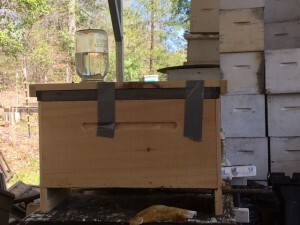 We then transported the cell swarm box, see image 1387, (which contained the Graft # 4 cells) from the shed, where it was dark and cool, to the hive # 8 which is our cell finisher hive #1. 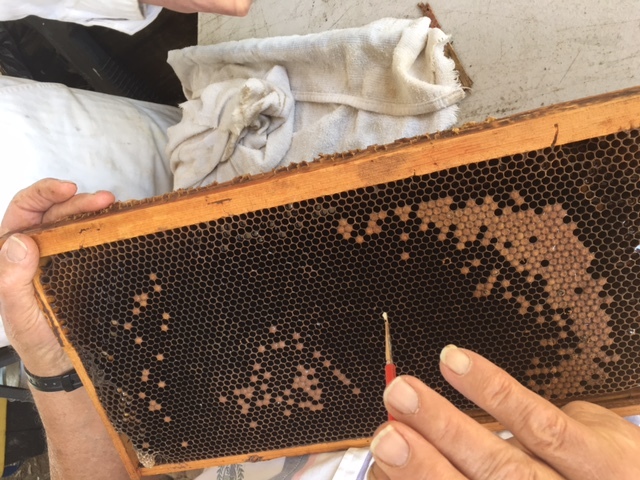 We removed the frame holding the Graft 3 , and noticed that the queens were emerging from their cells (protected by cages). We moved this frame to position 7 in the cell finisher. Next, we made room in position 5 for the Graft 4 (G 4) , see image 1385, and placed the cell frame in that location. We did not notice many cells that had been drawn out by the cell swarm box! Time will tell. 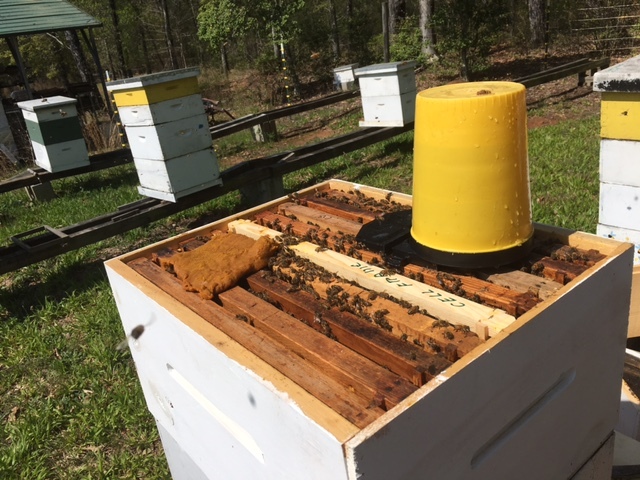 We then turned our attention to the Cell Builder Swarm Box where the nurse bees had been taken from Cell Finisher # 2 and #3 and replaced the frames of bees to these two hives. (Note: the cell finisher hive provide sufficient amount of nurse bees for the Cell Swarm Box without having to locate and remove the queen, as necessary in the Cell Builder Hive).